Use the size of the subject on screen as a rough guide to decide the size of the Focus Area, such as Flexible Spot. For Flexible Spot, the subject should be large enough to cover the whole Focus Area. Having the subject at this size avoids the focus drifting to the background. For Expand Flexible Spot, the Focus Area including the expanded area should just about overlap with the subject. 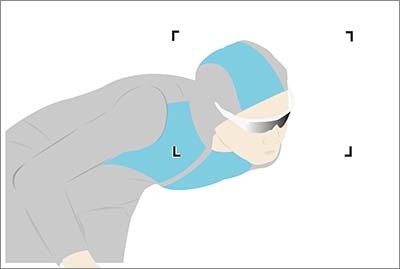 The optimal Focus Area size for the same skating scene depends on the subject size on screen. Flexible Spot M is recommended for focusing on the subject’s face. 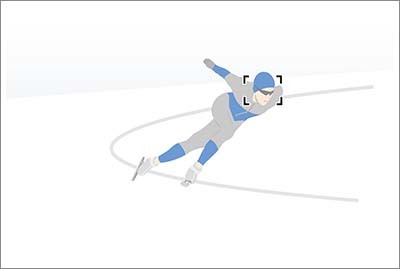 If set to Zone, other features such as line markings on the rink will be inside the area and the camera might focus on these instead of on the skater. To target a fast-moving subject at this size using a long focal length, try a wider setting such as Zone. If the situation requires switching between holding the camera horizontally and vertically, set Switch Vertical and Horizontal AF Area to [AF Point Only]. American football and ice hockey may look like they need similar settings, but there are subtle differences in how to better shoot them. In American football and rugby, where players come together and clash, Expand Flexible Spot will pinpoint the subject more accurately. 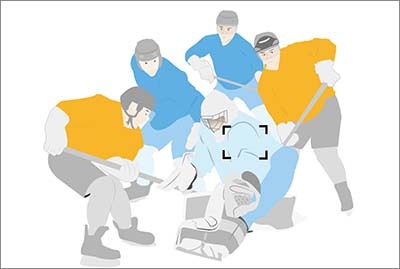 For sports like ice hockey where the subject is moving fast, try keeping the Focus Area to the same size as a player (M in the example above). If the area is too large and includes several players, the camera may not focus on the right one. 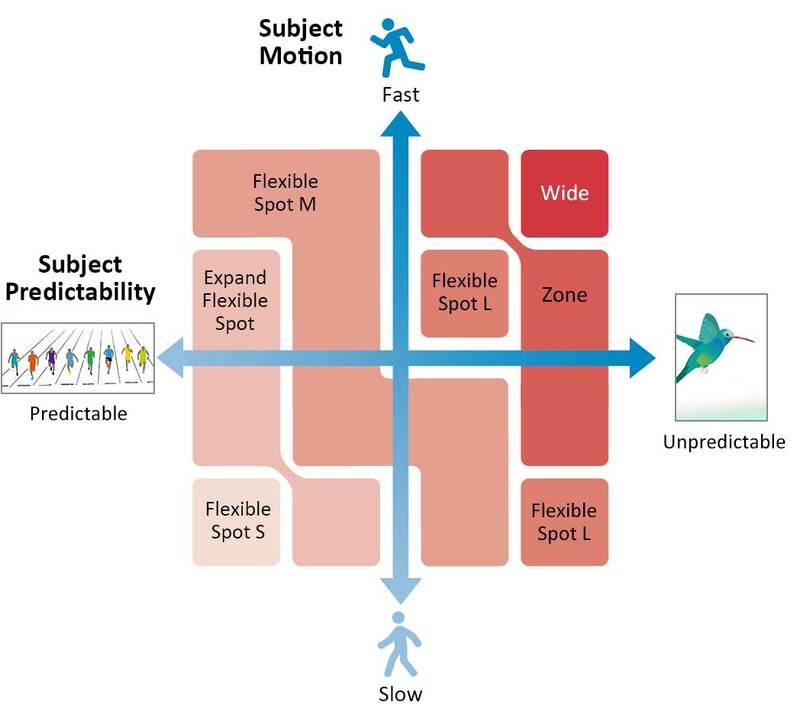 If a subject is moving slowly or predictably, a small-area setting like Expand Flexible Spot will focus accurately on the target position. If a subject is moving at high speed or unpredictably, a wider Focus Area setting such as Wide maintains focus while allowing the composition to be adjusted. [Wide]: We recommend placing the subject at or near the center of the screen before focusing. [Zone]: We recommend placing the subject at or near the center of the zone area before focusing. For both cases of [Wide] and [Zone], once the focus is confirmed and the focus indicator is lit, the subject will remain in focus within the focusing area, allowing greater flexibility in your composition. Flexible Spot S is good for focusing within an extremely narrow area, but it can be difficult to focus on some subjects. Expand Flexible Spot has the same area size as S, and if the camera can't focus inside that area it automatically focuses in the expanded area. 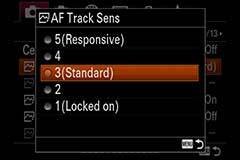 AF-C Focus Mode has five levels of focus tracking. Focus position is stable and stays locked on to the selected subject. The camera focuses quickly on nearby subjects instead of tracking a single subject. 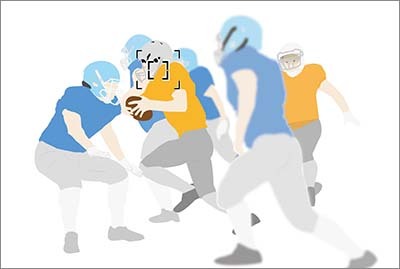 As a rough guide, this setting should be 2 when tracking a specific player in a sport like American football where players are close together, or 3 (standard) if someone is passing in front of the subject. In soccer, the players are generally farther apart so 4 is the most suitable setting as it prioritizes responsiveness over lock-on. 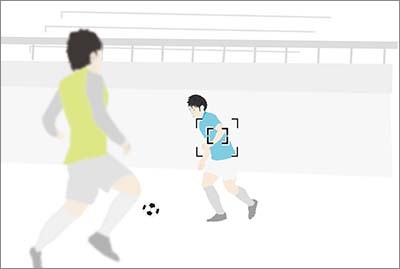 When set to 4, the focus will not shift if another player’s arm passes in front of the subject, but the focus will move to another player if their whole body blocks the original subject. 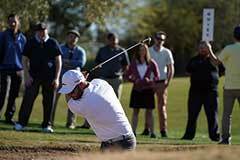 Try Balanced Emphasis, which provides a good balance between the existing AF and Release settings. Useful to combine maintaining accurate focus with catching a crucial moment when shooting a moving object. The shutter is not released until the subject is in focus, so there is a risk of missing the crucial moment. Allows shooting at any time, but at the risk of taking lots of photographs that are out of focus. Useful for ensuring a certain number of frames per second for Continuous Shooting. Shot are more likely to be in focus than with Release. Slightly fewer frames for Continuous Shooting than with Release. Recommended for shooting moving objects based on the situation immediately before shutter release, but use Release if timing is more important. The advantage of Release is that it maintains the Continuous Shooting interval even if the subject moves a lot. It's useful for shooting a series of continuous pictures or making a movie. 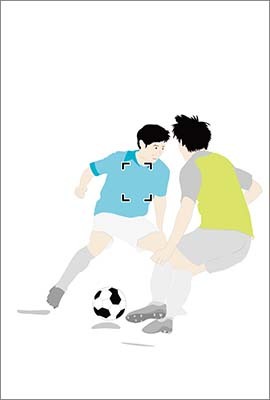 Take photographing a player kicking the ball in soccer as an example. 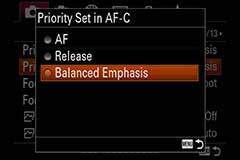 AF may miss the moment of the kick, while Release will capture the moment but all the shots may be out of focus. Balanced Emphasis will give some usable shots. Choose whether to adjust the position of the focusing frame (AF point) and Focus Area settings to the camera orientation (horizontal/vertical). The default setting is [Off], but [AF Point Only] is recommended if changing the camera orientation frequently, such as reorienting the camera vertically when the subject comes closer. The Mechanical Shutter produces shutter noise, which may be problematic in situations that require silence. The Electronic Shutter is useful for silent shooting as it produces no sound or vibration. If Shutter Type is set to Auto and Audio signals are turned off, only Continuous Shooting will be silent. If Shutter Type is set to Electronic Shutter, all Drive Modes will be silent. The AF Area Registration Function enables you to register the Focus Area with AF On to a custom key (Reg. AF Area+AF On) in order to switch to it immediately. For example, if you usually set Flexible Spot M, but the subject leaves the focusing frame or comes closer, you can press the customized key to activate autofocus using the registered Focus Area. When the targeted individuals are identified on the screen, place the flexible spot on the face you want to focus on, then press the Eye AF button to focus on the intended person's eyes.